normal rains, we’re having a season now that fits the descriptions old-timers here give to what rainy season “used to be like”. Rains starting in the early to mid-afternoon. Going into, and perhaps through, the night. Partly cloudy but clearing glorious mornings with Costa Rica’s plethora of wildlife providing the background symphony for the morning’s coffee. Ahhh! The Whales Tail View from Bella Vista #5. OK, enough of that life enjoyment stuff. Let’s get to business. By my reckoning, the high-season started 2 days ago (Monday, the 7th of November, 2016). I have been enjoying the typically slower time of September and October here in The Zone. Not nearly as many visitors here, glorious weather (a well kept secret is the rainy-season here in Costa Rica) and the demand on us real estate agents gets a bit lighter during these months as well. Monday, this changed as though someone had thrown a switch. Numerous e-mail inquiries coming in regarding various properties, sellers wanting to list their properties and buyers that are here wanting to see properties. So for those who are wondering when the high-season begins here in Costa Rica’s southern pacific zone, it is during November. And if this year is any kind of determining factor – early November. I mentioned in a previous post that we are doing a countdown on the number of under-$100k ocean view properties. There are still some left, but they are getting mopped up at a rather quick pace. Somehow, amidst all the business that is going on, there are a couple of ocean-view properties that are priced below market value – that haven’t yet sold. These have been topics for repeated discussion between myself, as the listing agent, and both buyers and agents from other agencies, in recent days. 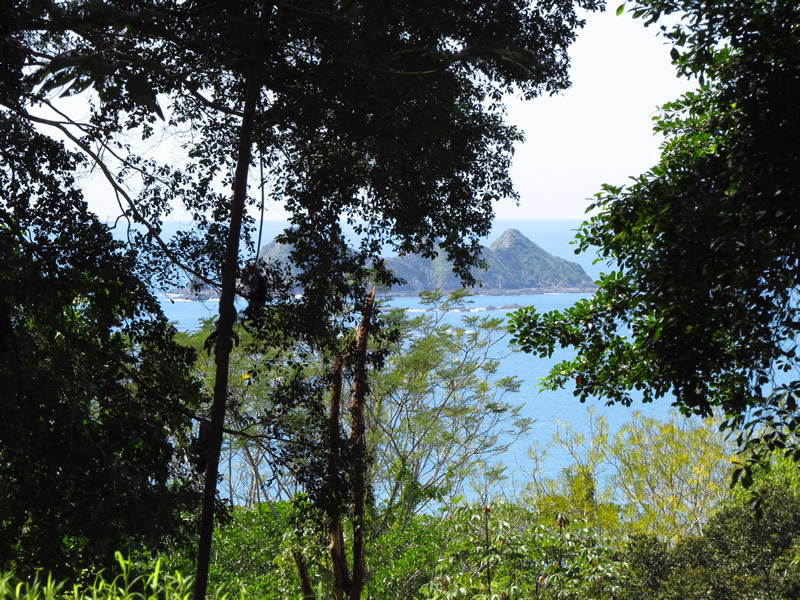 One of the properties is located here in Uvita and has a wonderful Whale’s Tail view as well as a soul-touching mountain range view that is frequently shrouded in tropical mists. It is essentially a 270° sweep from the ocean to the mountains behind. The other is located in an area south of Uvita that is called Ballena, which is Spanish for whale. Ballena is an area where the coastal mountain range comes down to very near the beach. So the ocean views in the Ballena area are frequently quite nice. Panorama of Bella Vista 5, the primary building site. The ocean is off to the right and also the lower building site. The first one is lot #5 in a development called Bella Vista (I fear using the term “development” due to the mental image it conjures up from other countries. This is “development” Costa Rica style. Large, private parcels tucked into the jungle and that look out at the ocean.) All of the properties in this development have sold over the past 10 or so years. This is a re-sale. As mentioned, it features a sweeping ocean to mountain view. It has a primary building site and a separate smaller building site for a guest house. The seller paid considerably higher than his asking price of $88,000. And in fact, he has recently lowered the price from $119,000 (also lower than he paid) to move it. I wonder if the price can actually be too low. Maybe the prospective buyer is thinking that there must be something wrong with it that’s not being disclosed. Relative to comparable properties on the market, this one is lower than it should be. In fact, I told the seller this when he told me to lower the price. He stuck to his guns and said that he’s got other interests in his home-land and he’s ready to sell. 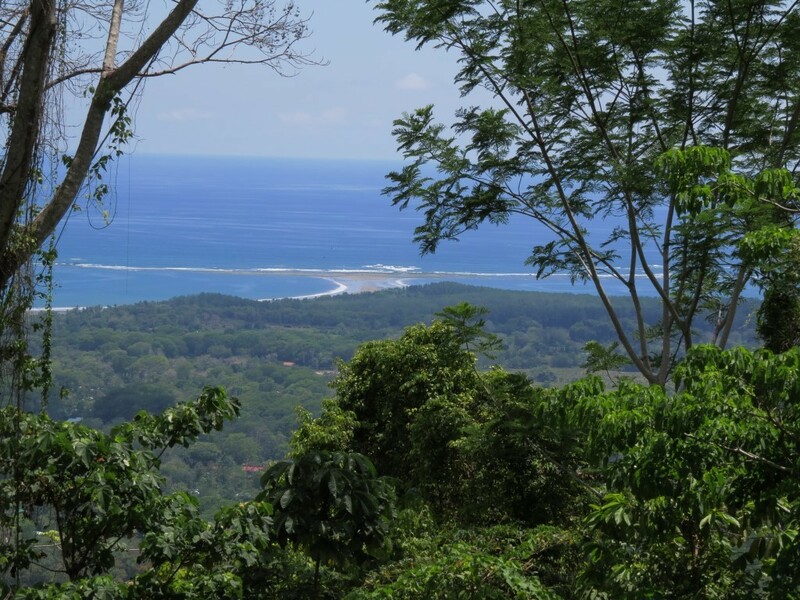 As for the Ballena property, it is in a great location and looks right out at Roca Ballena. It also has lots of usable rolling land where several other cabinas can be built. The asking price on this one is $83,000. Expenses to get the property ready to build: There is no tractor work done on the primary building site. The entry drive will need to be cut in. This is not extensive work. The area for the drive is already cleared so it is just a matter of some tractoring and bringing in material. I’d say around 40 meters in length or less. There may be some tractor work necessary to flatten the primary building area. I say “may” because of the various building methods that don’t require a flat building site. The natural lay of the land is flat-ish already. The smaller building site is ready to build. Overall, very little tractor work necessary. The water is to the property so there will be whatever the pipe costs to run the short distance to hook it up. The electric is about 200 meters away and will need to be run underground to the property. This is a slightly higher than normal expense for hooking up electricity, but not prohibitively so. the rolling areas apart from the primary building site have no ocean view. But, they are in a nicely shaded and accessible area. Annual road fees: as needed. The community pitches in. This fee is low on this property. There is no tractor work necessary for the building pad. There will be a very little bit needed for the entry, mainly to put in a cement tube (culvert) that passes under the drive alongside the road. This may be done by hand. If the large area between the primary building area and the creek is to be developed with additional cabinas, this will require additional tractor work. There is a creek that runs by the property. There is also a spring. There is no community water (ASADA) in this area so a concession is needed for water from the creek & spring. The cost of such a concession is $1,000-$1,200 at this writing. The labor and materials to set up the water system: catchment, pump and pipes, will probably be less than $2,000. The electricity runs right by the property so the hookup is standard. This article was inspired by my conversation with another real estate agent this morning. He said “Ben, it seems to me that these properties are priced quite a bit lower than they should be”. Indeed. So, I thought I’d share.